In an attempt to fight climate change, 60 space-faring nations have for the first time collectively agreed to engage their satellites, coordinate their methods and data to monitor human-induced greenhouse gas emissions. 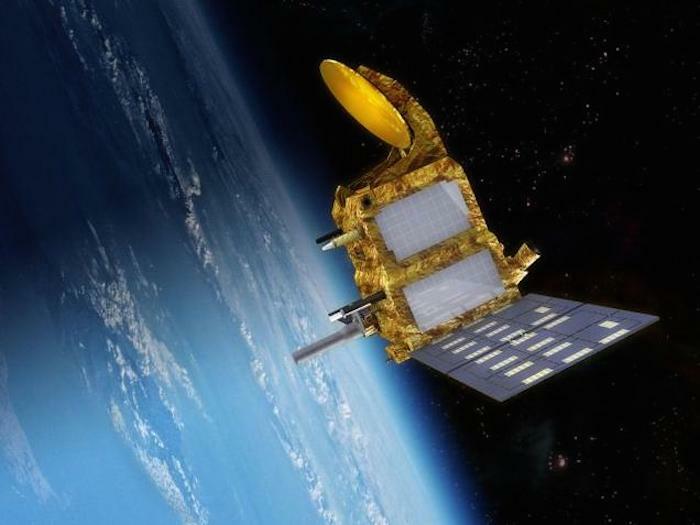 This was agreed at a meeting here on Friday at the invitation of Indian Space Research Organisation (ISRO) and French space agency Centre national d'études spatiales (CNES). “The world’s space agencies decided to establish “an independent, international system” to centralise data from their Earth-observing satellites through the ‘New Delhi Declaration’ that officially came into effect on May 16, 2016,” the Department of Space said in a statement on Saturday. “It is overwhelming to see the unilateral support of all space agencies to use space inputs for monitoring climate change,” ISRO Chairman Dr. A.S. Kiran Kumar said. The statement noted that without satellites, the reality of global warming would not have been recognised and the subsequent historic Paris agreement at the United Nations headquarters in New York on April 22 this year would not have been signed. The key to effectively implementing the agreement lies in the ability to verify that nations are fulfilling their commitments to curb greenhouse gas emissions, which can only be accomplished by satellites. The goal now will be to inter-calibrate these satellite data so that they can be combined and compared over time. Dr. Kumar said earth observation satellites provide a vital means of obtaining measurements of the climate system from a global perspective. “ISRO is committed to the continuity of earth observation data, through the thematic series of satellites, with improvements en-route, to meet contemporary as well as future needs,” the ISRO chief said. 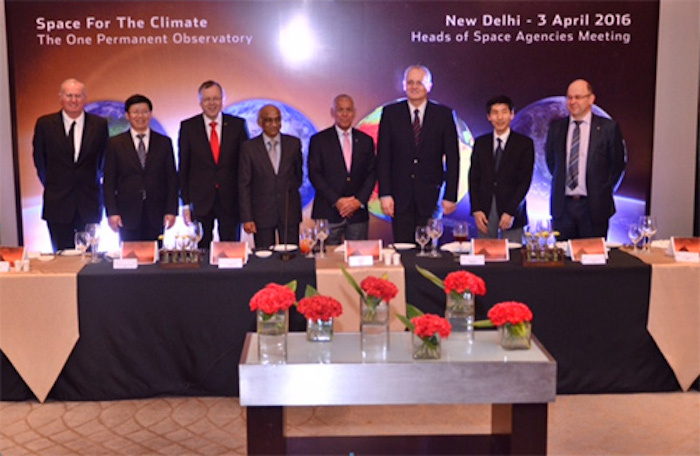 Heads of major space agencies of the world gathered in New Delhi April 3, 2016 . Credits: ISRO. For the first time, under the impetus of the Indian Space Research Organization (ISRO) and the French Space Agency (CNES), space agencies of more than 60 countries agreed to engage their satellites, to coordinate their methods and their data to monitor human-induced greenhouse gas emissions. The COP21 climate conference held in Paris last December acted as a wake-up call in this context. Without satellites, the reality of global warming would not have been recognized and the subsequent historic agreement at the United Nations’ headquarters in New York on April 22, 2016 would not have been signed. Out of the 50 essential climate variables being monitored today, 26 - including rising sea level, sea ice extent and greenhouse gas concentrations in all layers of the atmosphere - can be measured only from space. The key to effectively implementing the Paris Agreement lies in the ability to verify that nations are fulfilling their commitments to curb greenhouse gas emissions. Only satellites can do that. Invited to New Delhi by ISRO and CNES on April 3, 2016, the world’s space agencies decided to establish “an independent, international system” to centralize data from their Earth-observing satellites through the ‘New Delhi Declaration’ that officially came into effect on May 16, 2016. “THIS IS A HISTORIC EVENT..."